The Primae is a repurposed ORE design intended to ease the task of extracting resources from planetbound environments. Initially devised as a deep space salvage vessel for large-scale ore retrieval from destroyed ORE fleets in pirate-occupied areas, its previous incarnation was made all but obsolete by the arrival of capsuleers on the interstellar scene. Realizing that the ship could, with a few minor modifications, be made into an efficient resource harvesting aid, ORE wasted no time in revamping the design. A low signature radius (a holdover from its earlier manifestation) adds a layer of defense to the Primae's already decent plating. In addition, the ship's two large bays have been re-engineered to hold equipment for planetside resource extraction and processed materials, making it an especially useful complement to any planetside harvesting endeavor. 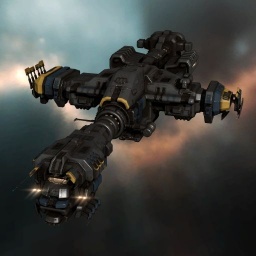 The Primae is a limited run ship that has become available to players on very few occasions. It was first released as a promo for Planetary Interaction, as it's the only ship that doesn't require any skills to fly. Nowadays, it's just a collector's item and rarely seen undocked. Further information about additional or recommended skills to pilot Primae for a specific or it's common role(s) can be written here. Cargohold expansion is avoided in favour of boosting warp strength and align time in an effort to avoid gankers, and because expanders only affect the 100m3 cargohold. No sub-article about Primae roles or piloting tactics. You can write them here. You can write additional notes for Primae here. This page was last modified on 6 February 2017, at 05:19.